Thousands of people flocked to the Cape Town Stadium to celebrate the life of the late Former President Nelson Mandela on Wednesday. Madiba died at his Johannesburg home on Thursday evening, at the age of 95. The function started with performances from various local artists which was followed by the National Anthem where the crowed sung in unity. Chairperson of the African National Congress in the Western Cape Marius Fransman saluted the former icon for the role he played in the struggle and uniting the people of South Africa. Fransman said we remember you as a freedom fighter, a revolutionary, activist and the father of the nation. The spirit of tata Mandela is already affecting us, let’s continue emulating his legacy. The atmosphere was joyous with several people holding placards of Madiba, with many wearing Madiba t-shirts chanting Rolihlahla. After MC Shado Twala opened the service, Cape Town Mayor Patricia de Lille took the podium where she described Mandela as a leader, a visionary and the very best among us. “I say that we must choose to live hope, I say that we must choose to live in the world of the vision of Mandela, I say we must make Tata Madiba to live forever in our efforts to make South Africa a country he will be proud of” De Lille added. Zille said Madiba was in peace and his face symbolized what South Africa has become, one nation at peace with ourselves and the world, one nation building one future. Minister in the Presidency Trevor Manuel closed by saying Madiba belonged to all of us and we will celebrate him together as the spirit of Madiba lives inside us all. Sometimes the inevitable is shocking. The news of Nelson Rolihlahla’s passing has left us shocked. But even as we grieve for the father of our nation, we remember that Madiba represented hope – hope that dedication, perseverance and going beyond individual goals is noble and worthy. Bush Radio,together with all South Africans, mourn the passing of Nelson Mandela – freedom fighter, our first president and an inspiration to the world. Nelson Mandela Biography:Nelson Rolihlahla Mandela was born in Mvezo, a village near Mbatha in the Transkei, on July 18, 1918. His father, Henry Mgadla Mandela, was the principal councillor to the Acting Paramount Chief of the Thembu and Mandela was preparing to eventually take over the position after his father’s death. But Mandela had dreams of helping his people in the fight for freedom. He was educated at a local mission school where he was given the name Nelson. After his primary education, he was sent to Heraldtown, a Wesleyan secondary school. He then enrolled at Fort Hare where he was elected onto the Students’ Representatives Council. He was suspended from university for joining a protest. Then he and his cousin ran away to Johannesburg to escape arranged marriages. He completed his Bachelor of Arts degree through the University of South Africa and then began studying for his LLB. He joined the African National Congress in 1943, a year after he graduated. In the midst of his political activities, he met his first wife, Evelyn Mase. A few months after meeting, they were married and eventually had four children. They divorced in 1958. In 1944, a group of 60 young ANC members, including Mandela, joined forces to create the African National Congress Youth League, which hoped to transform the ANC into a more radical movement. They thought that the current political tactics would never emancipate South Africa. Mandela was elected as the league’s national secretary in 1948. Mandela impressed his peers with his disciplined and hard-working ways and was elected to the NEC. He later became president of the youth league, and was elected National Volunteer-in-Chief in 1952 just as the ANC launched its Campaign for the Defiance of Unjust Laws, which involved mass civil disobedience. Mandela travelled the country organising resistance to discriminatory legislation. As a result, Mandela was given a suspended prison sentence for defying the Suppression of Communism Act and was confined to Johannesburg for 6 months. Also in 1952 he opened South Africa’s first black law firm in Johannesburg with his friend Oliver Tambo. But under the land segregation legislation, the authorities demanded that they move their practice out of the city. Mandela and Tambo refused. During the early fifties, Mandela led the resistance against the Western Area removals, Bantu Education and the Freedom Charter. During the fifties, Mandela was banned, arrested and imprisoned. And he vowed to not follow the rules and regulations of his oppressors. In 1958, Mandela married Nomzamo Winnie Mandela. They had no time for a honeymoon because Nelson had to appear in court for the Treason Trial. He was one of the 156 people accused in the Treason Trial. His incarceration put a damper on his political and legal work. After the Treason Trial collapsed in 1961, the ANC was banned and Nelson Mandela emerged as its underground leader. In March of 1961 Mandela addressed the All-in African Conference and challenged the apartheid regime to create a new, democratic constitution. He then went underground to lead the campaign. Mandela had many disguises to evade the police, which earned him the name the Black Pimpernel. He and other ANC leaders created a new section of the liberation movement that prepared for an armed struggle. He felt that continuing non-violent tactics was unrealistic since the government continued to meet their peaceful efforts with violence. Mandela travelled abroad to Swaziland in 1962 and was arrested shortly after his return to South Africa for illegally leaving the country. He acted as his own defence attorney during the trial and was convicted and sentenced to five years of prison. He was transferred to Robben Island in May 1963. He and 10 others were charged with sabotage shortly after. The Rivonia Trial lasted 8 months. Mandela decided that if given the death sentence, he would not appeal because he was prepared to die for his ideals. Mandela was found guilty and sentenced to life in prison on Robben Island. After 18 years at Robben Island, Mandela was transferred to Pollsmoor Prison in Cape Town in 1982 and then to Victor Verster Prison near Paarl in 1988. While in prison, Mandela refused to accept Bantustan policy in December 1988 in exchange for a reduced sentence. He also refused release from prison in exchange for renouncing violence. 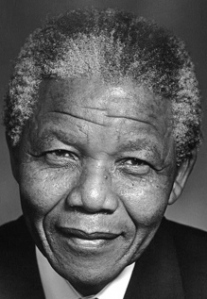 He was released from prison on February 11, 1990, and worked diligently to free South Africa from apartheid. In 1991 he was elected President of the ANC. In 1993 Mandela accepted the prestigious Nobel Peace Prize on behalf of all South Africans who worked so hard and suffered so much to achieve peace. After apartheid officially ended on April 27, 1994, Mandela and all South Africans voted for the first time. Mandela was elected as President of a democratic South Africa and was inaugurated on May 10, 1994. He served one term as president until 1999. 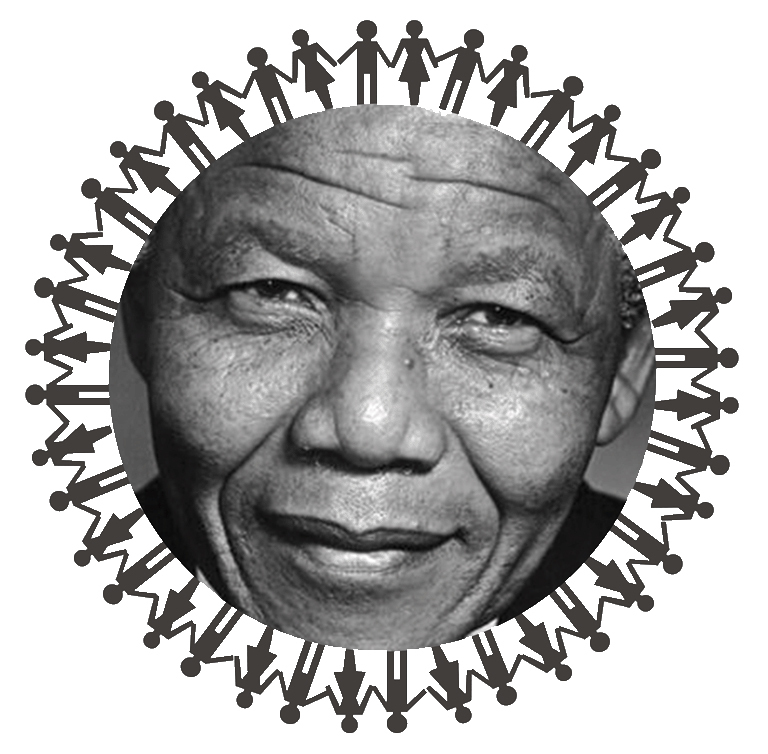 After retiring from politics, Mandela went on to set up three foundations: The Nelson Mandela Foundation, The Nelson Mandela Children’s Fund, and The Mandela-Rhodes Foundation. After his presidency, he continued his tireless efforts to foster democracy and equality and help the oppressed and deprived. He will always be a hero not only to the South African people, but also to the world. Some pictures from the Human Chain held in honour of Nelson Mandela’s legacy and our commitment to a united South Africa yesterday (18 July 2013) in Cape Town.
! !SPECIAL FROM THE BUSH RADIO ARCHIVES!! Audio from the first Nelson Mandela press conference held at Bishop Court after his release (12 February 1990). Today Bush Radio celebrates with the rest of the world the 20th anniversary of the release of Nelson Rolihlahla Mandela from prison. This morning Victor and Shiraaz paid tribute to him and we also managed to find his first press conference audio in our archives (See below).